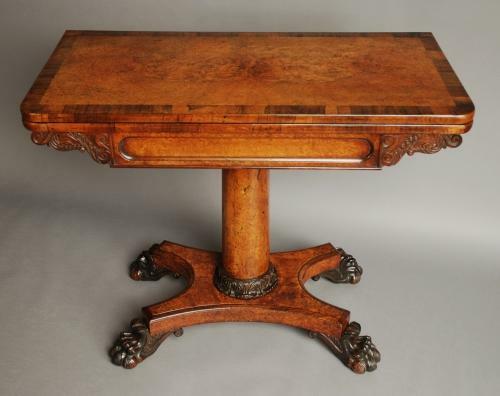 A rare & fine quality William IV card table veneered in amboyna & rosewood. The top consists of a large amboyna mirrored veneer with a fine Rio rosewood banding. The top opens up to create a card table. The baize on this surface has been replaced due to the original being in very poor condition. Underneath the top is a recessed front panel of amboyna & rosewood with carving at each end of stylised acanthus, typical of the period. This is supported by an amboyna veneered column with an acanthus carved collar at the base. The base is of quadraform shape, again veneered with amboyna and terminates with four scrolling acanthus hairy paw feet. Although this shape of table is not uncommon, to find one in amboyna wood is quite rare & unusual. The combination of the amboyna with the rosewood creates a very stunning & rich look. The amboyna wood was an exotic wood from Southern Asia often used in fine cabinetry work. This table is of stable construction and can go straight into a home.